At first glance, the rugged terrain of North Cascades National Park (www.nps.gov/noca) appears inhospitable to wheelchair-users and slow walkers. After all, this Northern Washington back country area is filled with jagged peaks and crowned by over 300 glaciers. That said, there is an accessible side to North Cascades — the State Route 20 corridor — which offers a number of accessible trails, including these top picks in the Newhalem area. 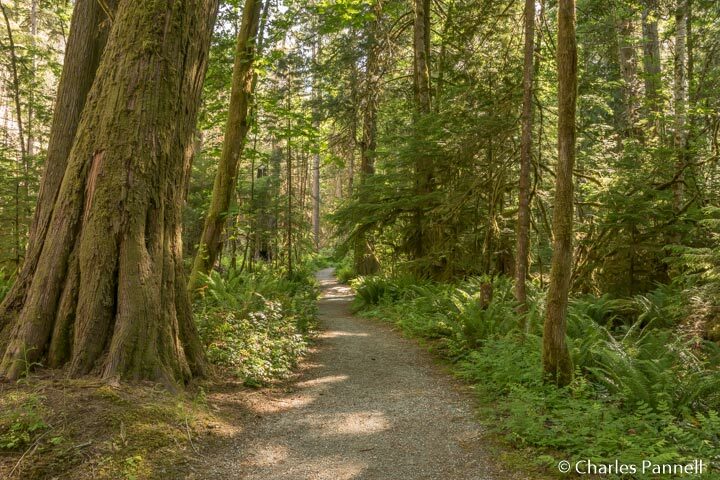 The popular River Loop Trail begins behind the North Cascades National Park Visitor Center; however the entire length of it is not accessible due to a steep grade and numerous obstacles near the visitor center trailhead. That said, a 1.4-mile accessible section of this loop begins between campsites 37 and 38 in the Newhalem Creek Campground. From there this level hard-packed dirt trail winds through the forest, along the river and through the walk-in campground. And if you need a rest stop, there’s a hard-packed dirt path to an accessible restroom next to walk-in campsite 130 along the trail. Don’t let the steep section of this trail near the visitor center stop you from enjoying this pleasant walk through the woods — take the alternate “more accessible” route from the campground. Although this utilitarian trail connects several key Newhalem sites, it also makes a nice one-mile round-trip stroll through the forest. 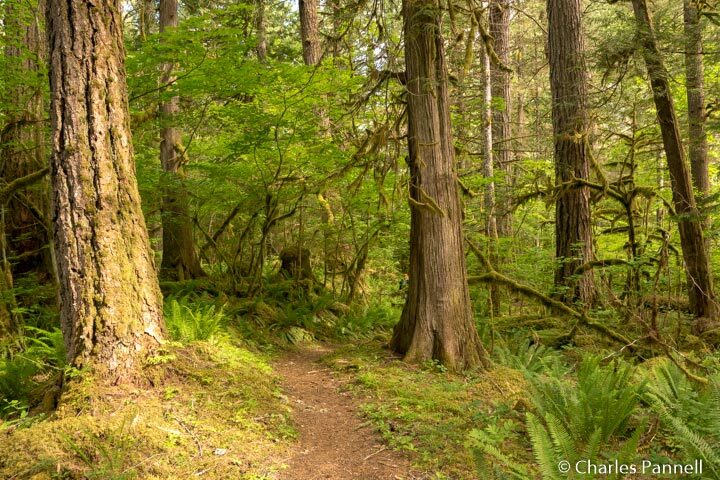 The hard-packed dirt trail begins across from the ranger station near Newhalem Creek Campground, and follows a fern-lined forest path for .1 mile to the Newhalem Creek Picnic Area. This secluded picnic area includes a site with an accessible table and grill, that’s set back off the road for maximum privacy. From the picnic area, the Linking Trail continues on through the forest for another .3 mile, where it connects with the Rock Creek Shelter Trail. Finally, the Linking Trail terminates in another quarter-mile at the Newhalem Powerhouse, where you can just pause to enjoy the forest, or continue on along the scenic Trail of the Cedars. The Rock Shelter Trail branches off the Linking Trail, about midway between the Newhalem Creek Picnic Area and the Newhalem Powerhouse. The best way to find the trailhead is to follow the Linking Trail from the Newhalem Creek Picnic Area, then turn left when you reach the service road. From there, it’s just a short jog across the bridge to the trailhead, which is located on the right. This .3-mile hard-packed dirt trail is level and doable for most wheelchair-users and slow walkers. It leads over to an old hunting camp sheltered by a large boulder alongside the creek (the rock shelter), which is believed to have been used by Native Americans some 1,400 years ago. Not only is it a pleasant walk, but the history and archeology of this site are also quite interesting. 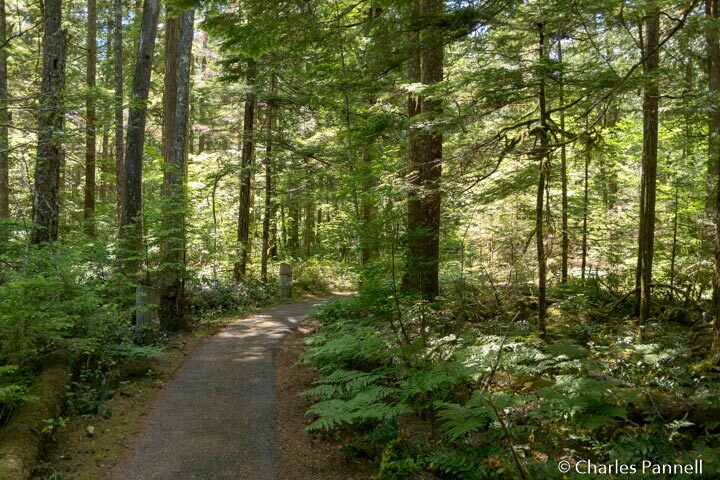 Last but not least, don’t miss the Trail of the Cedars while you’re in the Newhalem area. The .3-mile loop trail, which is maintained by Seattle City Light, starts near the Skagit Visitor Center, on the far side of the suspension bridge. From there this hard-packed dirt trail covered in stabilized granite winds through the cedar forest, over to the Newhalem Powerhouse and back to the bridge. Part of this area was burned in a fire in 1922, while another section was involved in a 2015 blaze. The remainder of the forest is composed of old growth cedar and some downed nurse logs, and the whole area serves to illustrate the regenerative process of the forest. Interpretive plaques are located along the trail, and although there is one slight uphill portion, the bulk of the trail is fairly level and doable without assistance. Alternatively, you can access this trail from the Newhalem Powerhouse, at the end of the Linking Trail. It’s a pleasant trail with lots of shade, and it’s a great place to beat the heat on a sunny afternoon. ‹ DOT Releases Air Travel Accessibility Materials	› Amtrak Accessible Compartment?